Leonardo is in a quiet environment in the hills in a restored building divided into separate units. It is close to famous cultural centres like Florence, Siena and Pisa, that can all easily be reached by train from Castelfiorentino. Volterra, the Etruscan city and San Gimignano with its towers (UNESCO) are only 25/35km away. 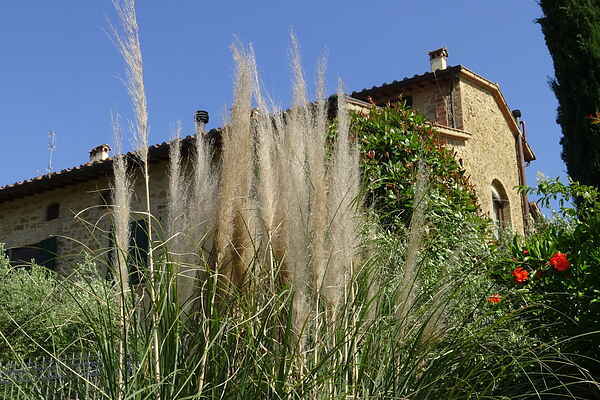 The well-kept house has a rustic Tuscan interior, a beautiful garden with a stunning view. At just a five-minute walk you will find a horse riding school, where at a fee you can take an accompanied ride or a riding class. Here you can also order a shopping basket. Certaldo is only 10 km away, where you can reach the medieval town with its castle and museum dedicated to Boccaccio by cable car. In Certaldo there is also a public outdoor swimming pool. In the surroundings there are several swimming pools available, often offering views of the Montaione valleys. For the sports enthusiasts; you can rent a bike and enjoy a ride through the Tuscan hills. The owner has invested in a new sofa bed for the apartment and has taken on a new cleaning lady in 2016. Closeby you will also find San Vivaldo; where a collection of 25 fifteenth century chapels can be found, decorated by students of Della Robbia can be found immersed in the woods. There are many things in the area that I would recommend to you. First of all, the view of this amazing landscape. In addition, San Gimignano is definitely a city that you should not skip. With its 14 medieval towers you can admire while trying the best ice cream in the world !! Nearb in, San Vivaldo you'll find a collection of 25 fifteenth-century chapels of terracotta, immersed in the woods, made by the students of the world-famous artist 'Della Robbia'. A good restaurant nearby, where we recommend you to try the 'Tagliata' is called 'Il Caminetto', specializing in Tuscan cuisine.